Research is now pointing to unheralded levels of stress in the American population. Unfortunately, as we get stressed, we also tend to quit taking care of ourselves, which simply creates more stress. After years of dietary advice which had people switching from butter (a traditional food) to other forms of oils for cooking and eating, new research shows that we may have taken a wrong turn. 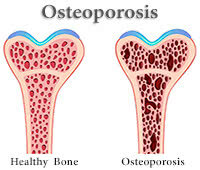 The good news about osteoporosis is that it is largely a preventable condition. Taking the right actions can help you to avoid problems later. The trick is to get weight-bearing exercise (including strength training) and prevent key nutritional deficiencies. Many of us find that we just don’t get through the day without some kind of boost to help our energy. For the majority, that will mean turning to caffeine in some form. However, when we turn to caffeine in the form of energy drinks, we could be placing ourselves in harm’s way. What are the Side Effects of Low Carbohydrate in your Body? Our body requires minerals, nutrients and a balance in order to stay healthy and sound and in this connection each and every component plays its respective roles.